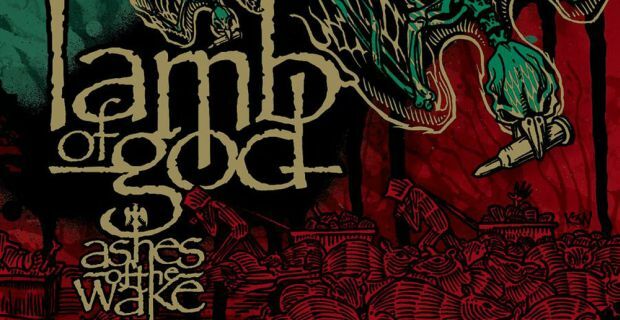 This August will mark a decade and a half since the Richmond, Virginia-based, modern thrash metal monster LAMB OF GOD unleashed their 2004 major label debut, ‘Ashes Of The Wake‘. To properly commemorate this milestone, LAMB OF GOD announce the expanded, 15th anniversary deluxe edition re-issue of this incredibly successful album, originally released through Epic Records. The new double LP will feature the original record, plus four non-LP tracks: the Japanese bonus track / B-Side “Another Nail For Your Coffin“, and three previously unreleased demos. For those that were around to experience this iconic recording’s original release, it struck a severe blow to the notion that more aggressive or extreme metal bands, were limited as to where their popularity might ascend. ‘Ashes Of The Wake‘ was a battering ram that effectively smashed barriers and propelled LAMB OF GOD to a whole new plane that they utterly dominated by sheer force of will. Like its predecessor ‘As The Palaces Burn‘, released within the span of the prior year, this album was also an uncompromising sonic document, but highlighting the more alluring traits of the band’s music. With an abundantly growing amount of groove with irresistible hooks and just the right amount of melody, songs like “Laid To Rest“, “Omerta“, and “Now You’ve Got Something To Die For” became instant fan favorites. Plus, LAMB OF GOD managed to get guitar virtuosos Alex Skolnick (Testament, Metal Allegiance) and Chris Poland (Ohm, Damn The Machine, ex-Megadeth) to provide the killer solos on the instrumental title track, “Ashes Of The Wake“. The ‘Ashes Of The Wake‘ 2xLP expanded edition on limited Green Smoke vinyl – also included with merch bundle options – will be available to LAMB OF GOD webstore patrons only. Pre-order is active now at this LINK. Additional retailers will carry standard black vinyl. A digital version will also be available on all digital service platforms; find pre-order HERE.